An OTC transaction in which an investor takes a view on the realized volatility of some instrument, usually an index, over a specified time period. 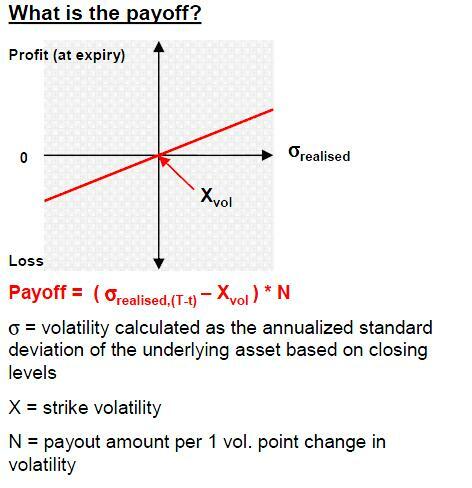 An agreement is entered to pay/receive a predetermined amount for every volatility point difference between a fixed volatility strike and the actual volatility of the underlying for a set time period. The balance is either settled at expiry or on an ongoing basis through the life of the swap. The hedge portfolio is not static, and therefore requires more active management by the hedging party. Provide pure exposure to volatility alone, unlike vanilla options in which the volatility exposure depends on the price of the underlying asset.These swaps can be used to speculate on future volatility, to trade the spread between realized and implied volatility, or to hedge the volatility exposure of other positions. Mainly Hedge Funds and some Pension funds trading, with insurance companies and asset management looking. The advantage of volatility swaps is they provide pure exposure to the variability of the underlying price rather than regular call and put options that have variance exposure in a diluted form since they also carry directional underlying risk: delta. Trading volatility directly can help investors to diversify risks and move towards an uncorrelated portfolio.